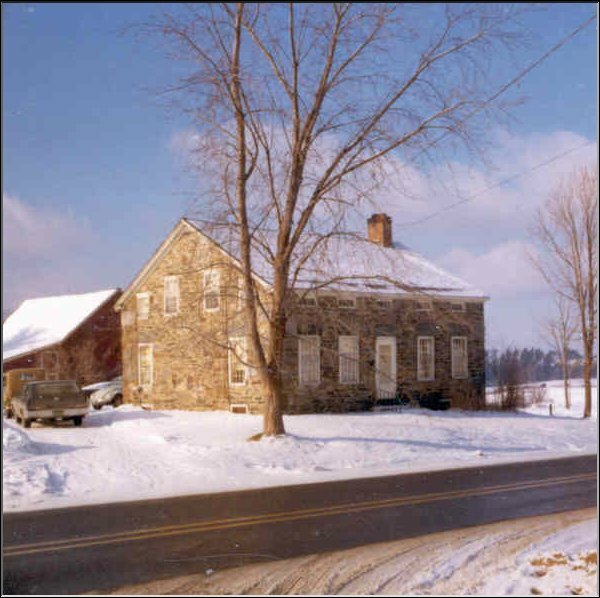 Possibly the oldest structure in the town, built by the Hessian Revolutionary soldier and stonemason, George Magers, who also built two other solid stone structures in Fairfax (604-22, 604-38). This structure, at the northwest end of the village is the finest of the three, and in the best condition, though the interior has been gutted and altered. The structure was built for Joseph Beeman in c. 1795 and sold to Joseph Grout in 1814. At one time the building is reputed to have been an inn. 1 1/2-story, 5 x 2 bays, stone structure w/a wide plain narrow overhang, and short cornice returns. The unadorned central entrance is recessed 1 1/2 feet. The right interior end chimney has a corbelled cap and has been reworked. The corner stones and lintels atre massive. Windows on the first floor are 12/12 in plain surrounds. On the eaves side there are narrow horizontal eyebrow windows. On the gable ends their eaves side are four second floor windows: two 12/12 flanked by shorter and narrower 9-light windows. Immediately behind the house, there is a 1 1/2 story, frame constructed, gable-roofed barn w/a shed extension. Clapboard and vertical plank siding.